What Makes Our Food So Yummy? That is what mommy nature intended for me to eat. There is no junk or fillers that will make me sick. Keeps me at my ideal weight. Gives me a soft, silky coat and reduces shedding. Reduces my allergies, itching, and rashes. Naturally cleans my teeth and freshens my breath. You'll have less poop to pick up on our walks. The house won't smell like me anymore. Feed Me, daily superfood is the ideal solution for those pet parents who want to be sure they're giving their best friend exactly what they need. Made in the USA from Midwest grass-fed 100% USDA certified beef, meaty bones and whole organ meats such as the liver, heart kidney fortified with amino and omega-rich blood and fat. Feed Me is a complete nutritional powerhouse. You will never find any grains, fillers, preservatives, or coloring in any of our products. By including these prime ingredients lacking in most dog foods today, you re providing your dog with one the healthiest, nutrition-packed foods available anywhere on the planet. 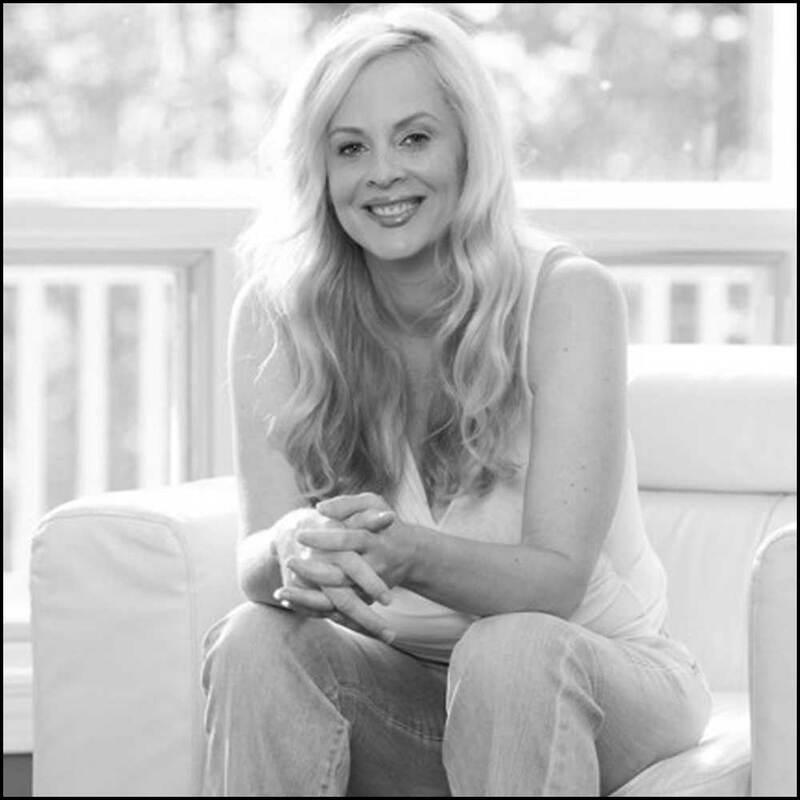 Veterinarian Jan Hale (DVM) on TruDog! 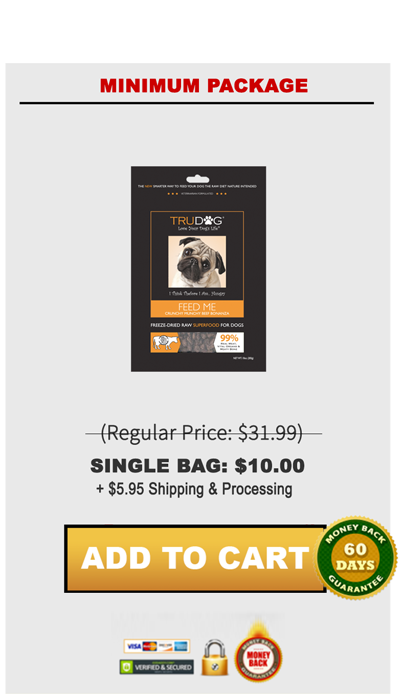 TruDog is a suite of dog food, treats, and toppers that truly are the best for your dog because they have everything from essential enzymes to keep their cells healthy and digestive system functioning properly to high-quality meat-based proteins that keep your dog strong and lean. Trudog also boasts essential amino acids that help improve joint function, brain function, and overall wellbeing. These amino and essential fatty acids are the building blocks of your dog's cells. 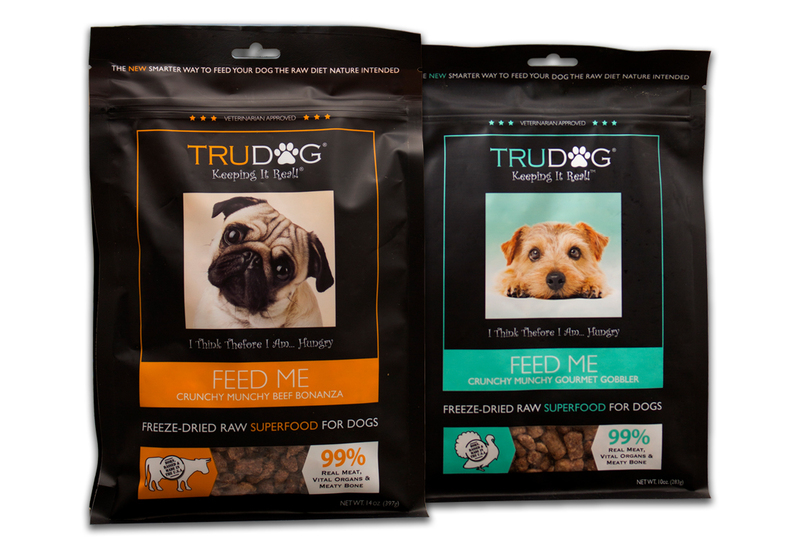 All of this makes TruDog a Super Food indeed! Your dog wants real meat for dinner. No grains, gluten, or fillers - just real, fresh meat - just as nature intended. Locally sourced from America's heartland, with a perfect blend of fresh, wholesome beef, bone and organ meats; this food can be served as a complete and balanced meal, a nutritious treat, or mixed with kibble. Any way you serve it, you can't go wrong; the benefits are visible within weeks Love Your Dog's Life! You may be asking yourself, why no veggies or fruits? 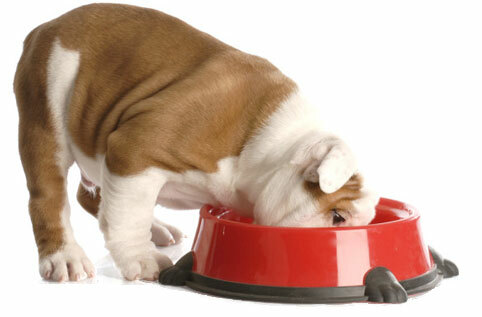 TruDog's Feed Me was formulated to fit into most any raw diet out there, BARF, Alpha Prey, and many more. While we feel it's a better way to feed your dog we understand that over the last hundred years or so, dogs have adapted to process veggies and fruits (Although not that well). You see, your dog shares the same digestive system a wolf in the wild has which is why raw meat and vital organs provide your best friend with everything they really need. That said, you can add fresh wholesome fruits and veggies to our food without a problem. 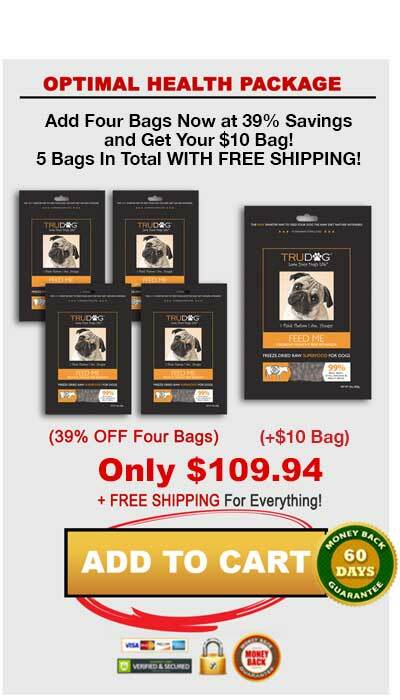 Not only will it help to extend the amount of time a bag will last you're also ensuring that your dog is getting 100% human grade veggies and fruits. Most pet food manufacturers today use veggie and fruit fillers that would not be able to be sold in a supermarket as they're not fit for human consumption. Why pay them to fill your dog food bag with expensive and sub-par veggies? Do yourself a favor, try a bag of Feed Me and mix in your own at home. If you don't see a better, happier dog just take us up on our 60-day unconditional money back guaranty! 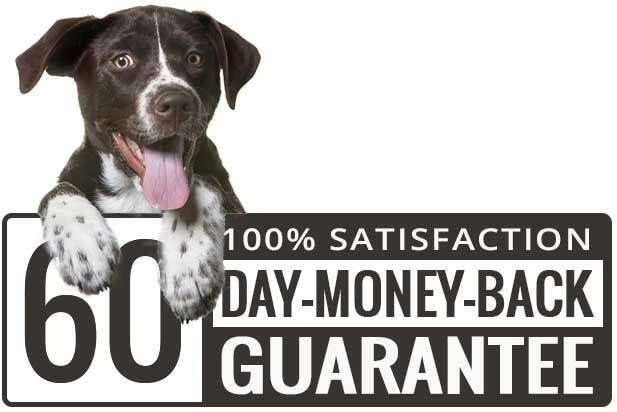 We are so sure that you will be 100% satisfied that we are going to offer a 60-day full money-back guarantee – just to try it! If for some reason you or your dog is not satisfied with our product, don’t hesitate to return to us for a FULL refund at any time. We’re serious, for a full 2 months, if you don’t see a happier, healthier dog simply contact us for a full, no questions asked refund. Subject: The Amazing Healing Power Of God & Trudog! This story is about Bailey, my wife Fama and I's furry little friend. Bailey is a miniature Schnauzer that we purchased eight years ago from one of our local pet stores. After a few days Bailey began to have a problem, he was having diarrhea with blood in it, after changing foods several times with no change we took him to our vet who referred us to another vet, who referred us to another vet, until we finally ended up at a vet's office who's specialty was diagnosing pets with problems. He performed a test similar to a colonoscopy, and discovered he had colitis, he then told us that there was no cure, but it was manageable with the proper diet and medications. He prescribed prednisone, amoxicillin, & canine i.d. which he forwarded to our vet for filling. Little did we know that the prednisone was supposed to end after two week's and the rest continue from that point forward. Our vet continued the prednisone along with the food and amoxicillin for the next seven years. About a year ago Bailey began having severe diarrhea, bleeding, and was losing weight as well. After many trips to our vet trying several different antibiotics and other meds, we ended up where we started, at the diagnosing vet's office. When we showed him all the meds we were giving him is when he noticed that we were still giving him the prednisone, that's when he about died, he said we had to wean Bailey off the prednisone, we couldn't stop it cold turkey, and he had to give him some of the most powerful drugs there was to try and get him well. That's when things really got tough for Bailey, my wife and I. We were in the middle of many sleepless nights, trying to keep our thoughts positive when we had to take Bailey back to the diagnosis vet. He told us that he thought that Bailey had cancer, which we were very familiar with since we had already had to put two other furry friends down in past years. We were at the end of our rope, didn't want to go through this again. We called on our church-going friends and asked them to put Bailey on their prayer list, we asked all our family members to pray for Bailey, and my wife and I prayed earnestly for Bailey to be cured of this terrible disease. One night I was sitting in front of my computer just looking for anything that might help cure bailey of his problem when an infomercial came up on my screen it was about a thirty-minute infomercial about TruDog. I watched and listened to every minute of it when it was over I told my wife that god just sent me a message through the TruDog infomercial. We immediately ordered some of the food on the TruDog web site. Bailey was weaned off the prednisone, by the time we got the food, we started feeding him the food immediately, and by the way, he loved it. We know that God has a plan for everyone and everything and I am truly convinced that God sent that infomercial to me through TruDog, and that all the prayers that were prayed for bailey were answered. Bailey is a happy healthy little furry friend, who is completely healed of colitis, he has gained all his weight back, has normal bowel movements with no bleeding, and all of us are getting a good nights sleep thanks to god and TruDog. Thank you, Lori, for all you do for so many folks out there who have furry friends enjoying good healthy lives from the dedication and sacrifice you have put into a product that we trust. 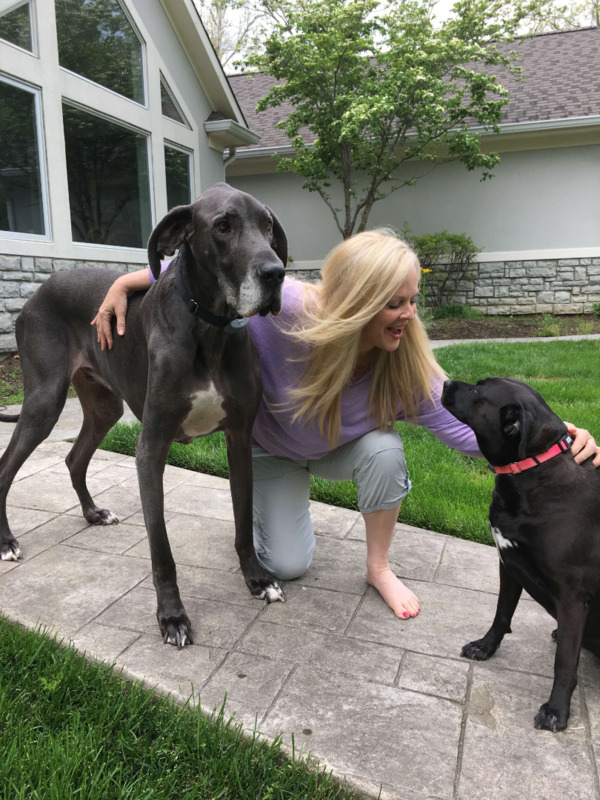 From Eddie & Fama G.
After losing the love of my life, my giant blue Great Dane Truman to cancer, I thought I'd never be able to love another dog like that again. Luckily, God sent me T.J. (Truman Junior), Emma (a lab/boxer rescue) and Taylor, a Great Pyranese/Collie rescue - my very own fur earth angels. Not to mention my two cats Lilly and Gucci (also rescues) and my live-in-the-house pig, Rudy (also a rescue) and my six horses. Being an adopted child myself, I know what it feels to be left behind. But I also got the gift of believing in second chances too, when they chose to save me. Raising me to always be the champion of the underdog is very literal now! You see our dogs really are worthy of eating much closer to the way mother nature (God in my book) designed. A fresh diet of raw meat. Full of not just muscle meat, but also organs, blood - even bone. 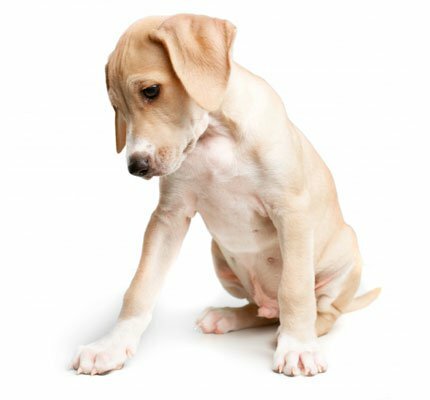 Your dog's digestive system was designed to work optimally with the amino acids and digestive enzymes from raw meat - without it, our dog's system struggles to thrive. Unfortunately, with the advent of kibble in the 1950s, we unknowingly committed to a dry, fake, practically tasteless for our fur babies. Exposed to high heats most of the good proteins, vitamins and minerals are destroyed during processing and cooking, and lots of unhealthy grains and cereals are added. It's not any healthier for dogs than it is for us two-leggers. 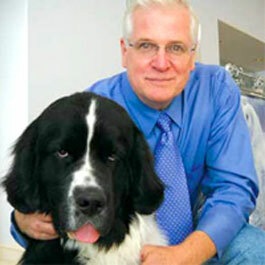 After Truman died, I discovered dogs were 4 times more likely to die of breast cancer, 8 times more likely to die of bone cancer and 35 times more likely to die of skin cancer (Texas A&M University)...they have fur!!! 'FEED ME'. And while I LOVE our 'FEED ME' freeze-dried raw dog food (I truly believe it's the best in the world - 100%), it IS an expensive way to feed your dog...especially if you're a big dog lover like I am! Sadly, I knew first hand after my Trumie's passing, if anyone needed support it was certainly these giant dogs who weighed as much as teenagers. That's why I was so determined to create a product that anyone could afford to boost their dog's bowl - no matter what the size! Helping even our 150 lb + love bugs - and voila! 'Boost Me' was born. It took us a long time to bring our boosters to life and when we did, I remember thinking, "It's A Miracle." Ironically, when the reviews started coming and our fans agree, calling it a 'Miracle Sprinkle'. And that's when I really began to feel the wings of angels at my back lifting us higher and higher. I like to believe Truman's tail wagging with every 5-star review. And while we know not everyone will go to the lengths we did to keep our dogs healthy and living longer… with 'BOOST ME', I hope we’ve made it easier for those who would. 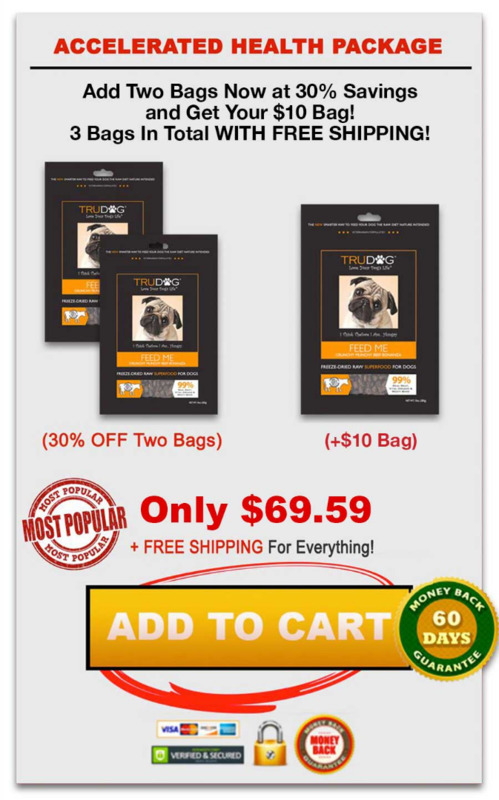 TruPet is a small woman-owned pet food and supplement company, dedicated to helping ALL dogs live longer.